As mixed reactions trail the just concluded Vice-Presidential debate for the 2019 general elections at the Transcorp Hilton Hotel in Abuja among 5 political parties, namely – Allied Congress Party of Nigeria (ACPN), Alliance for New Nigeria (ANN), All Progressives Congress (APC), Peoples Democratic Party (PDP) and Young Progressives Party (YPP), the candidates of APC and PDP, Yemi Osinbajo and Peter Obi respectively actually stole the show with their preparedness and articulation. 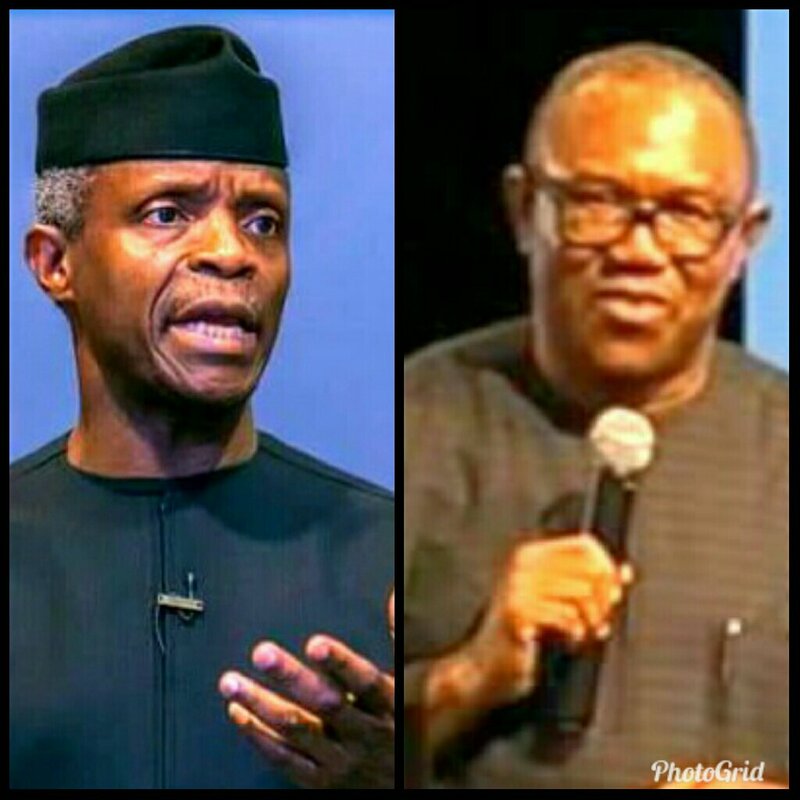 As usual, VP Osinbajo regaled the audience with data and statistics on what the current government has done, is doing and will do, while Peter Obi reeled out theories citing other countries’ economic situations. Osinbajo listed his government’s achievements in infrastructural developments and social investment interventions. He highlighted some ongoing railway line works while specifically commending the Lagos Ibadan express way which he said was nearing completion. Obi, on his part, read out statistics from China, Malaysia and Indonesian but avoided detailing how they intend to tackle the corruption scourge in Nigeria the way it’s done in those climes, throughout the debate. He said: “Fighting corruption is not an economic policy. You can’t leave your shop and be busy chasing criminals around”, which clearly reveals his party’s unease at the anti-corruption crusade and war of the current government. In response to Obi’s swipe, Osinbajo responded: “If you don’t chase criminals away, you would end up with no inventory in your shop.” He further stated: “you cannot have a thriving economy if you allow the type of grand corruption that has taken place in Nigeria in the past 16 years.” This is a truism. No country attains sustainable development with endemic corruption as its culture like it was under past governments. Obi also asserted that the African Continental Free Trade Area (AFCTA) agreement was not properly negotiated because stakeholders were not consulted in the process of preparation before it was finalized and that it was wrong for Nigeria to want a renegotiation during the signing ceremony. To this, Osinbajo responded that it was PDP’s government that did the negotiations during the Goodluck Jonathan tenure, which was passed over to the current government of APC. He also cleared the air on the controversy trailing the AFCTA agreement that the MAN (Manufacturing Association of Nigeria) and NACCIMA (Nigerian Association of Chambers of Commerce, Industry, Mines and Agriculture) advised Buhari not to sign yet. Another erroneous claim by Obi was that Nigeria has about 2 million vehicles, as against the recent statistics by the NBS of about 11.5 million vehicles. On fuel subsidy, Obi and other candidates argued on the need to put an end to subsidy on petroleum importation. Osinbajo countered that it must be done gradually to avoid a sharp increase in price to as much as N220 per litre of petrol, which will overwhelm the populace and exacerbate hardship. Obi also stressed that his government would support Small & Medium Enterprises in the country and create an enabling environment to attract foreign investors. In reply, Osinbajo enumerated the social intervention programmes the current government is undertaking to support SMEs in the country including investing in power at some markets like the dedicated power plants for Ariara Market Aba, the Kano Main market and others. “This is not about what we are going to do, but what we are already doing’. As far as many observers are concerned, it’s a no victor, no vanquished debate, but which in no small measure helped to provide an insight into the distinct ideological differences of the two main political parties – APC and PDP. So, how would you rate the performances of the candidates in this Vice-Predidential debate?